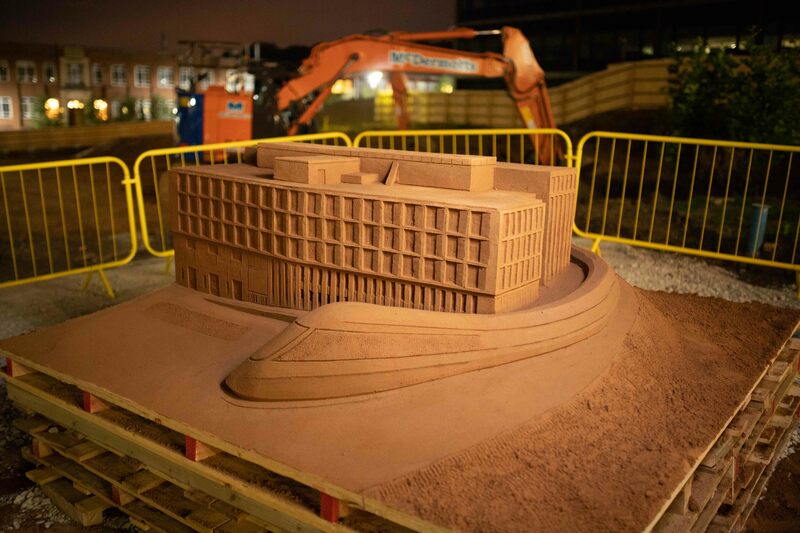 Usually at Sand In Your Eye we are asked to create sand sculptures of things that already exist, so it was quite a challenge to be asked by construction company Willmott Dixon to make a 3d sand art replica of one of the University of Birmingham’s proposed buildings still under construction, the new School of Engineering. 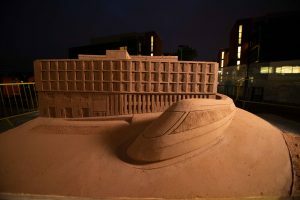 This meant our sand artists Jamie Wardley and Rich Spence had to go back to the architect’s blueprints to build the sand sculpture. 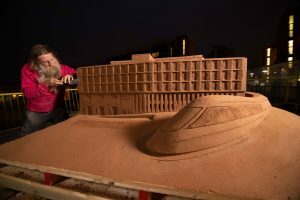 Willmott Dixon were also able to show Jamie and Rich the engineering drawings and 3d rendered images on the computer to help them accurately scale up and make the sand carving. 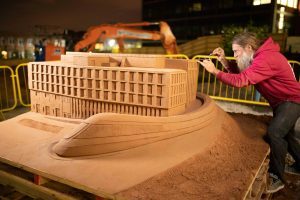 This software is a bit more advanced than our usual planning methods and both Jamie and Rich thought it was amazing the way they could zoom round the building and look at it from any angle, and even look through windows and see tables, chairs, offices, labs, research spaces and study suites already imagined. 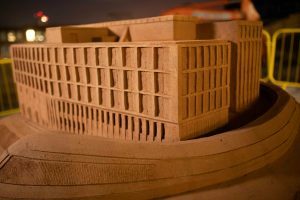 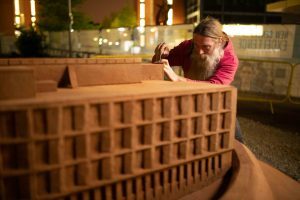 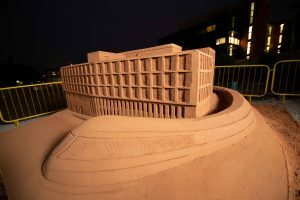 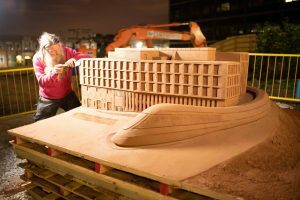 The sand carving was made on the very building site of the future School of Engineering at the University of Birmingham’s campus and was carved from building sand. 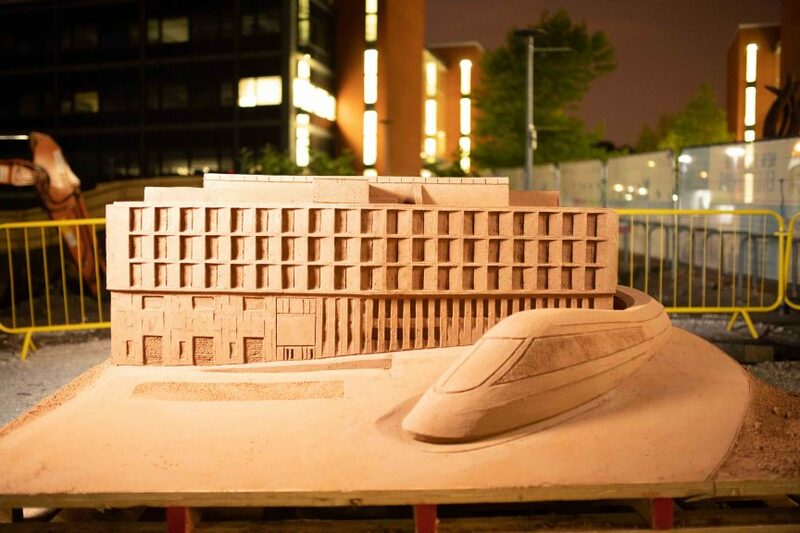 Willmott Dixon kindly provided the sand and made a stage for the two tonne table top sand sculpture. 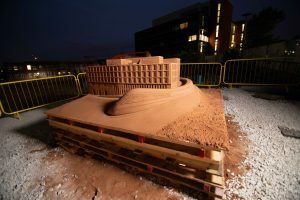 Jamie and Rich worked late into the night on both days of the two day sand sculpting and ended up working under the sites flood lights. 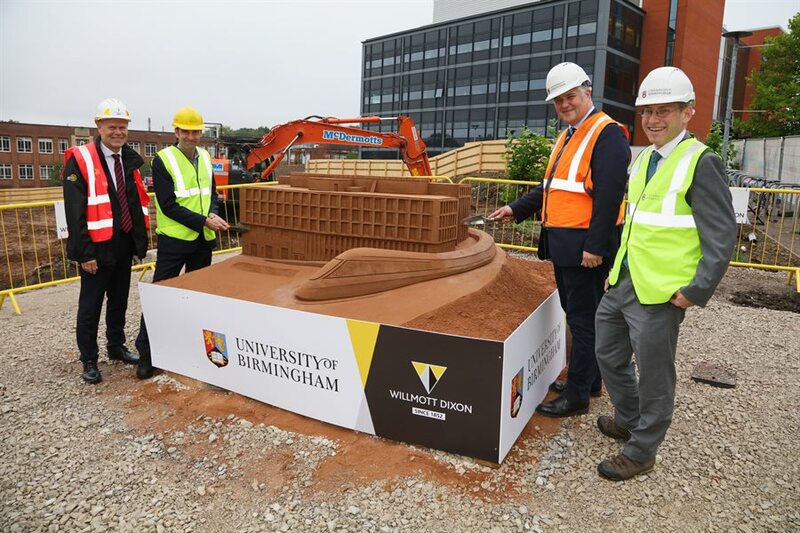 The new School of Engineering block will be completed in 2020 and will be a state of the art space, designed especially to be a flexible learning environment with lots of light and space. 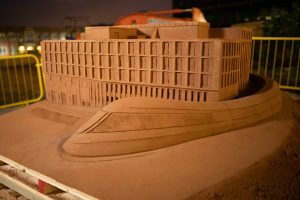 The building will house the engineering department and will also be home to the UKRRIN Rail Digital Systems Innovation Centre (DSIC), which will specialise in railway research on digital systems, focusing on matters such as railway control and simulation, data integration and cyber security. 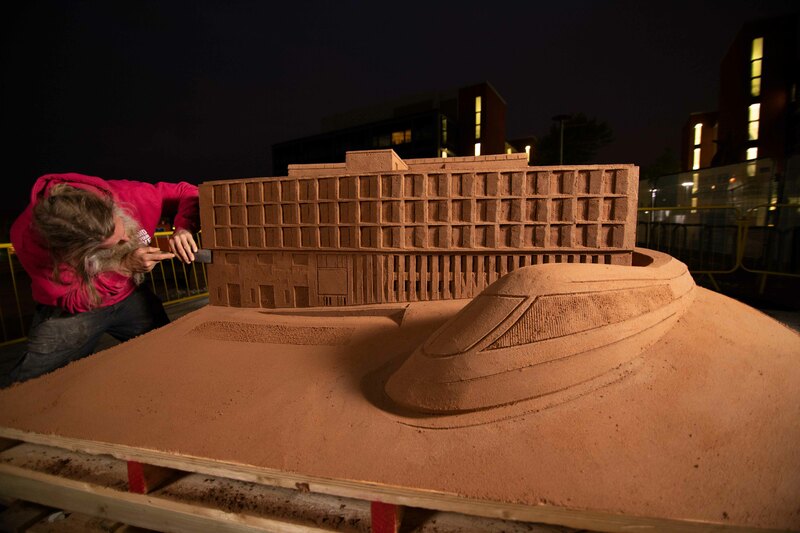 To illustrate these exciting developments and plans; as well as a sand sculpture of the planned construction, Jamie and Rich sculpted a sand art train zooming around the side. 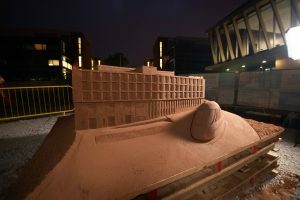 We can’t wait to see the final School of Engineering building rise up from the ground; we hope the engineers of the future find the new space inspiring.